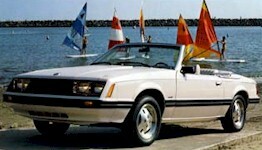 Ford contracted out some 1200 units to Intermeccanica Custom Coach Builders to build the Mustang Cabrio convertible. The conversion used parts from a Mercedes-Benz. Check out this rare one. Ever seen a 1982 Mustang convertible? Ford contracted Intermeccanica Custom Coach Builders to convert some 1200 Mustangs into convertibles in 1982. The conversion added a whopping $14,000 on to the price of the car. Jason, the owner, tells us more, "I purchased it on December 1, 2009. It is an early-production Intermeccanica 'Cabrio', with a production unit sequence in the 8,000 block. The data sticker shows a body type of 66H. It was built in August of 1981 and sold new in November, 1981 by City Ford in Los Angeles. It has power windows, steering, brakes, and A/C. The interior is factory red with white leather upholstery. The engine has been freshly overhauled and runs like a Swiss watch. Original Bright Red (27) paint is super-nice, suggesting it spent its life indoors. The colors, options, overall well-kept condition and early production indicate the car was probably purchased by someone with power and prestige, perhaps within the auto industry. The seller owned the car only two years and had no information on prior ownership history. The recent owner had two reasons for selling the car. First, it needs the original top replaced and Intermeccanica was of no help to him in finding the original pattern. Second, he didn't have funds to replace the automatic transmission. Anyone with info on Intermeccanica Mustangs is invited to contact me." Here is an ad for the 1982 Mustang convertible from Intermeccanica Custom Coach Builders. Ford didn't make a convertible Mustang in 1982. But they did contract Intermeccanica to build a few. The ad says, "Open car driving fun with an accent of style."